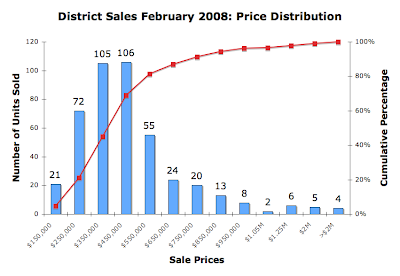 I've finished my analysis of full value residential sales the District recorded in February 2008. It continues to be ugly out there. 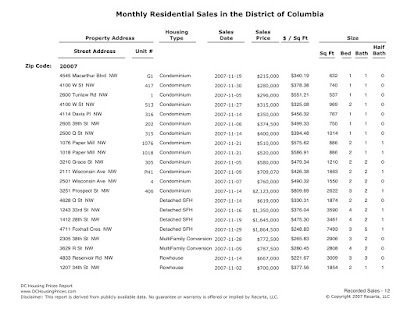 In the District, sales volume is way down and condo and home prices are lower. Like January, I'm noticing more sales involving financial institutions; I assume these are foreclosures. February's sales data includes 31 "sales" to financial institutions. These sales represent slightly more than 7% of the month's transactions. All data has been uploaded for viewing on DCHomePrices.com and DCCondoPrices.com. 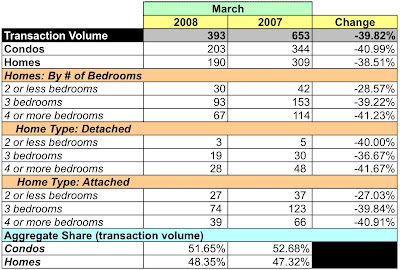 In February 2008 the District recorded 441 residential sales. Only one ward had higher sales volume. 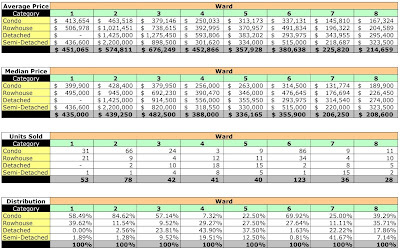 Wards 1, 5, and 8 had positive growth in prices; Wards 2, 3, 4, and 6 were negative; Ward 7 split the difference. Ward 4 had the steepest drop in sales volume, down 43%. Condo sales dominated sales in Wards 1-3 and 6. In Ward 1, 58.49% of sales were condos; and Ward 2, 84.62%; Ward 3, 57.14%; and in Ward 6, 69.92%. Ward 6 accounted for 35.98% of all condo sales in the District, followed by Ward 2 at 27.62%. The chart below shows the distribution of February's recorded sales by sales price. In the aggregate, average prices were down almost 10% and median prices fell 2.12%. Sales volume continued its downward spiral, falling 25.38%; condos fell 26.46% and homes declined 24.06%. Overall demand for single family housing is down 24.06%. Average prices were down 14.29% and median prices were down 7.04%. All categories of houses had declining sales volume. I continue to believe the high end homes - those costing more than $1MM - are skewing the results. The data show that the average sales price for a District home was $508,701 in February. Of 202 homes sold, 15 sold for more than $1MM for a total dollar volume of $24,115,500; the eleven most expensive home sales were in Wards 2 and 3. In other words, 7.4% of February's recorded homes sales accounted for 23.47% of the dollar volume. Excluding these homes, the average home price in the District is $420,545, about 17% less. Excluding these 15 homes would reduce the District's aggregate average sales price by slightly less than 10%, to $391,718 vice $433,078. Note: I use the District's downloadable data, which usually has a 6-12 month lag, meaning that the data doesn't include condos or homes completed within the past year. Data may not be available for all properties. My analysis is dependent upon the completeness and fidelity of the District's appraisal data. 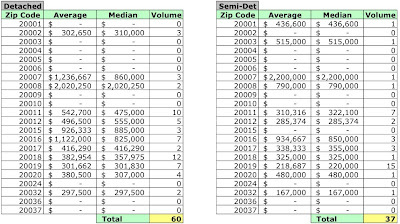 February 2008 average and median sales prices and unit volume by zip code. 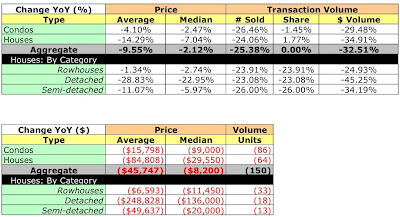 February average and median sales prices and unit volume by ward. Unlike MRIS, my data and analyses include new units [primarily condos] so there will be some differences in my conclusions about the market's state compared to a similar analysis based solely on MRIS reports, which only report sales of existing units sold and/or listed by real estate agents. This analysis is of sales recorded by the District during the month as opposed to sales settled in the month, which is what MRIS reports, so there may be some discrepancies because of timing issues. However, I believe the data do provide a helpful indicator of trends in the District. Sales may have been recorded by the District's Recorder of Deed during the month yet may not appear in the District's real property sales database, my data source, many months later. Consequently, those sales will not be in the month's analysis. My analysis is based on District sales and appraisal data that I've collected and processed. I've deleted those sales that appear to be of questionable data quality. Errors are always possible. My analysis is limited to condos and single family homes; I omit properties the District classifies as multifamily conversions. I'm sure I'm excluding some properties that are legitimate single family homes, but I want to eliminate uncertainty. During French class Saturday, I discussed an article that was in the WaPo's real estate section that day and learned a new verb: dégringoler, which can mean "to tumble" [a reputation], "to tumble down" [a person], or "to collapse" [price]. The verb comes to mind when considering the consequences of the actions reported in the article. According to the WaPo, effective May 1 AIG United Guaranty, which sells PMI insurance, "no longer will write coverage on condominiums in hundreds of Zip codes across the country that it designates as having "declining" market conditions, including some in the Washington area." I went to AIG's website and downloaded their "declining markets" tool - every zip code in the District is classified as being in a declining market. Several mortgage companies, e.g., GMAC and TB&W, have already announced they'll require buyers in declining markets to put more money down towards a purchase. Both firms list all District zip codes as being in a declining market. Basically, if you want to buy a home/condo in a declining market, you'll have to make a minimum 10% down payment. So, if it's harder to get a first loan and impossible to get PMI coverage in the District, what do you think will happen to the District's condo market? 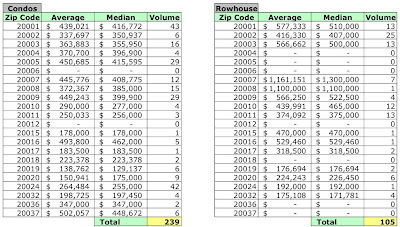 I've uploaded data for residential sales the District recorded in February 2008 to DCHomePrices.com and DCCondoPrices.com; it's available for viewing now. The data analysis is forthcoming. Update [4/21]: The analysis will be delayed a day. The District's real property sales database reported one home's sale price at $5.3MM higher than the actual sales price. That skewed the average sales price for homes for the month by about 6%. I have some rework to do. Thank you, DC OTR. Occasionally, I receive an email from someone with a comment about a recent blog post or a question on a topic I've not discussed. For example, I received this email today from a fellow about condo fees. I thought I'd post his question, my response, and then ask whether this blog's readers had corrections for my response, further elucidation, or other information that would help. How should I, as a buyer, be thinking about condo fees in the context of condo buying v. house buying? That is, what do these condo fees generally incorporate that I would otherwise be paying for if I owned a house? Power? Water? Insurance? Trash? A house would have maintenance expenses that I wouldn't have in a condo - I might have to pay someone to mow the lawn, but then again I'd have the lawn to use, unlike in a condo. Bottom line is I am just trying to figure out the best way to do an apples to apples, condo to house, price comparison. It's definitely a factor to consider. First, they're not tax deductible and, worse, they can increase. I've heard of one building - new construction - where the condo fees doubled in a year from $400 to $800/month. Generally, the fee covers common expenses like building maintenance, insurance, staff salaries, trash collection, management company fees, etc. It could include cable TV, too. My experience has been they're set based on the size of your unit. I would expect you'll have to pay your own power bill, unsure about water. You'd also have to buy insurance to cover your personal belongings, much like renter's insurance. The condo board should also be placing a portion of the fees towards a reserve to cover unexpected or planned, future expenses; having inadequate reserves could result in your receiving an assessment to cover the gap. I look at condo fees as cash I'd rather put towards something else, especially when I see units that have $1000/month condo fees. If you're doing a financial analysis, include the condo fee in your analysis and model a range of percentage increases to see where they become unsustainable. You might find that applying that extra cash to a mortgage, where a portion of it would be tax deductible, makes it easier for you to buy a home instead of a condo. Some of you may recall my asking several times last year why the District wasn't recording any sales for Ten Ten Mass [1010 Massachusetts Ave NW, DC, 20001] since it looked like construction had finished. Was this an ominous sign for the building and the market as a whole? No! Several of you emailed me / posted comments saying that many units had closed and that all was well. Right you were. Eventually, the District added the building's sales to its real property sales database with their actual closing dates, effectively backdating its database. 1010 Mass condos is a 14-story, 163-unit condominium in a new building developed by Rock Creek Properties (RCP), Faison & the Carlyle Group. Sales began Oct. 2005; settlements began early Summer, 2007, the project sold out by late spring 2008. Sales by McWilliams Ballard, with prices from $400k to $1.5m; parking available to purchase at $37,500 (limit of one). Located downtown, 3 blocks from Metro (Mt. Vernon), a short walk to Penn Quarter, this waving brick and glass structure will have 8700 s.f. of ground floor retail, rooftop lap pool, and overlook the new DC Convention Center and Mass Ave., with floor to ceiling windows in some condos. Underground garage will house space for 169 cars (i.e. only one per unit), and 217k s.f. of gross space. Faison, very active in Washington DC real estate, has projects throughout the southeast and southern Florida. Architectural design by Esocoff & Assoc., Glen Co. performed construction before they went bust after completing about 80% of the building. While those folks may claim that the building's sold out, not so according to the District, which says that 48 units are still available. BTW, how could it be "sold out by late spring 2008" when Spring is less than a month old? Also, I think there's a discrepancy in the number of units. Both the District and this site state that 163 units were built. I go with the District [for now]. The District has recorded sales for 115 of Ten Ten Mass' 163 units through the end of February 2008. I'm hard pressed to believe that units PH210 and PH211 were both purchased by the same person for the same price, but that's what the District says so it must be so. The table below lists each sale at Ten Ten Mass [use the scroll bar on the right]. I've found no resales in the building to date. As of April 14, I find one unit advertised for sale. It's a 2/2 available for $575,000. It's currently renting for $2850 / month and has a $490/month condo fee. Unit #706 is available as a furnished rental. For a whopping $4150/month rent and $200/month for parking, you get a toaster, a blender, sheets, and towels along with the 24 hour security. Unit #1011 can be yours for $2499/month. It's a 1/1, 744 sq ft. MLS DC6649713. MRIS has released its data for sales of existing home sales in March 2008. Fewer units sold, lower dollar volume, condo prices down, single family home prices down. A familiar refrain, but the severity of the downturn in March is startling; +40% reductions in volume is not just a small bump in the road. Dollar volume: $ 210,508,482. Down 42.62%. Units sold: 393. Down 39.82%. Average sales price: $ 535,645. Down 4.65%. Median sales price: $ 399,500. Down 8.06%. Sales volume. Overall, down 39.82%, worse than February. YoY, condo and home sales volume dropped through the floor, down 40.99% and 38.51% respectively. Sales volume was negative across the board. Condos represented slightly more than half of the units sold, 51.65%. Dollar volume. In aggregate, down 42.62%. YoY, condos were down 42.6% while homes were down 42.63%. 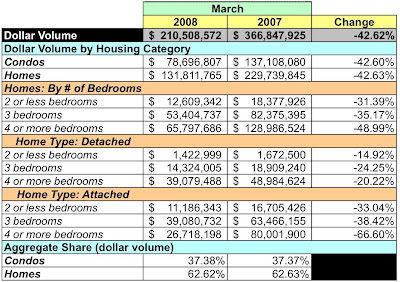 Dollar volume was negative for every category of housing. Average sales price. Overall, down 4.65% YoY. 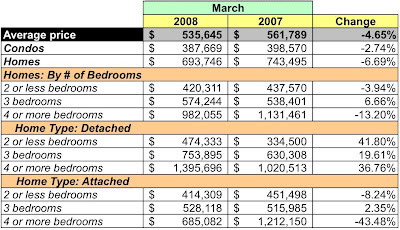 Condos fell 2.74% to $387,669 while homes declined 6.69% YoY to $693,746. Detached homes has solid price growth, but the fact that fewer sold for a lower total dollar volume tells me the high end continues to skew the market; detached homes tend to be the more expensive homes. Days on market. RIP DOM. Inventory. Based on the month's transaction rates and active listings, there is a 7.97 month supply of condos, a 3.74% decrease from February, while home inventories are at 9.56 month's supply, a 5.32% increase compared to February. Essentially, March continues a downward trend that began in July. When dollar and sales volume each fall by more than 40%, it ain't good out there. Beware the Ides of March? The number of condos sold fell 40.9% and the number of homes sold declined 43.9%. a medieval small bomb used to blow up gates and walls when breaching fortifications. In a typical implementation, it was commonly either a conical or rectangular metal object containing 5 or 6 pounds of gun powder, activated with a slow match used as a fuse. It was often placed either inside tunnels under walls, or directly upon gates. When placed inside a tunnel under a wall and exploded, large amounts of air would often be released from the tunnel, as the tunnel collapsed. By securing the device firmly to the gate, the shape of the device allows the concussive pressure of the blast to be applied entirely towards the destruction of the gate. Depending on design, a petard could be secured by propping it against the gate using beams as illustrated, or nailing it in place by way of a wooden board fixed to the end of the petard in advance. As Shakespeare's Hamlet says in Act III, "For tis the sport to have the enginer Hoist with his own petard." Effectively, Hamlet turns the table on King Claudius [the engineer] at the expense of poor Rosencrantz and Guildenstern. See this site for an explanation of the relevant plot. And they haven't signed any tenants. "They are certainly getting what they deserve," said Dean Baker, co-director of the Center for Economic and Policy Research, a liberal research group. "Mortgage bankers encouraged people to take out mortgages that were very risky, and the result of that was a large number of the mortgages went bad and caused mortgage interest rates to soar. Now they are the victims of high mortgage rates and chaos in the market more generally." Rosencrantz and Guildenstern are still dead. If you don't want to set up your own 67,000-record database, how do you figure out when and where to buy? Economists and others who study the real estate market say you can look at the neighborhood and the economy for clues. A major indicator: the number of houses for sale in a neighborhood and the number of days they have been on the market. I can tell you that in Tenleytown, homes are going under contract in a week if they're priced right. However, if they're not priced right and have the added touch of two cast cement lions on pedestals at the foot of the driveway, they're not selling: witness DC6615846. The house was purchased in 2003 for $505,000. It was renovated last year and then encased in stone. The seller's set a ridiculous price of $1.7MM. The highest price recorded on that square was $1.15MM in late 2006; the last sale on the square was $680,000. The sale ain't gonna happen anywhere near $1.7MM. I love the lions. One more thing: Shouldn't everyone have their own 67,000-record database? Thanks for the mention, WaPo. Is a Lack of Recreational Cannabis Dispensaries Keeping DC Home Prices in Check?